Kevlar Steel Back System, 70% over stock holding capacity. Extra Long Life & Heavy-Duty The FX200 System uses the Power Plus I Pressure Plate and the Steel Back Kevlar disc. 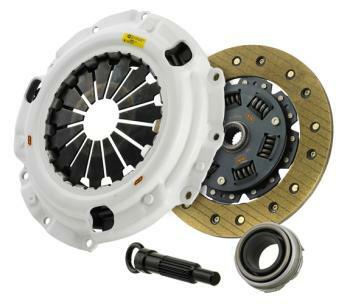 This clutch is designed for the street enthusiast or weekend racer. The FX200 offers similar torque holding capacity to the FX100, however, with the Kevlar disc, its life expectancy is increased 2-3 times. It features only slightly increased pedal pressure (over stock components), significantly longer life than stock and normal clutch feel during engagement and disengagement for the smoothest operation of any stage we offer.